Katsuya Eguchi (Japanese: 江口 勝也, Hepburn: Eguchi Katsuya, born May 15, 1965) is a Japanese game designer, producer, and deputy general manager at Nintendo Entertainment Planning & Development, most known for being a creator and a spokesperson of the Animal Crossing series. He was born in 1965 in Tokyo, Japan and grew up in the Chiba Prefecture. He began work at Nintendo in 1986 and spent some time doing promotional artwork before starting as a designer on Super Mario Bros. 3. He first served as director for Star Fox in 1993. Other games he has directed include Super Mario World, Star Fox 2, Wave Race 64, and Yoshi's Story. Eguchi served as a senior producer of his own EAD software development group, but currently serves as the Deputy General Manager of Nintendo's Entertainment Planning & Development division. 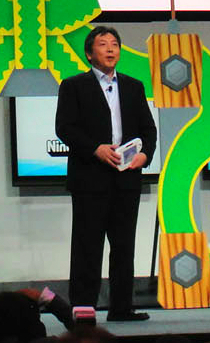 Eguchi is credited with the creation of the Animal Crossing series. Mental Floss writes that "Animal Crossing was inspired by Eguchi’s experiences...when he was a 21 year-old graduate who’d taken the decisive step of moving from Chiba, where he’d grown up and studied, to Nintendo’s HQ in Kyoto." And in addition: "Eguchi wanted to recreate the feeling of being alone in a new town, away from friends and family." "Animal Crossing features three themes: family, friendship and community. But the reason I wanted to investigate them was a result of being so lonely when I arrived in Kyoto! Chiba is east of Tokyo and quite a distance from Kyoto, and when I moved there I left my family and friends behind. In doing so, I realised that being close to them – being able to spend time with them, talk to them, play with them – was such a great, important thing. I wondered for a long time if there would be a way to recreate that feeling, and that was the impetus behind the original Animal Crossing." ^ Samantha Sofka (March 28, 2014). "Animal Crossing's Katsuya Eguchi Explains How the Series Embraces Change". nintendolife.com. Retrieved February 22, 2016. ^ Stephen Totilo (September 14, 2015). "Some Inside Baseball For Nintendo Fans As EAD Transforms". kotaku.com. Retrieved February 22, 2016. ^ Stew Shearer (September 25, 2013). "Nintendo's Shigeru Miyamoto Talks About Passing the Torch". escapistmagazine.com. Retrieved February 22, 2016. ^ Chris Schilling (June 1, 2013). "Animal Crossing New Leaf: a different kind of social experience". telegraph.co.uk. Retrieved February 22, 2013. ^ Savino, Candace (2008-07-16). "E308: Live highlights from Nintendo's private conference". Nintendo Wii Fanboy. Weblogs, Inc. Retrieved 2008-07-17. ^ Becky Chambers (March 29, 2014). "Nintendo Devs Credit Animal Crossing: New Leaf's Success To Having A Gender-Balanced Team". themarysue.com. Retrieved February 22, 2016. ^ Jason Cipriano (May 5, 2013). "'Animal Crossing' Developers Pick Their Favorite Characters". mtv.com. Retrieved February 22, 2016. ^ Rad, Chloi; Otero, Jose. "Nintendo Reveals Restructuring Plans". IGN. Retrieved 15 September 2015. ^ Andrew H (March 27, 2014). "While Animal Crossing may never see a mobile game, there could be companion apps on the way". droidgamers.com. Retrieved February 22, 2016. ^ Stephen Totilo (June 8, 2013). "No Retro Games in Future Animal Crossings—With One Possible Exception". kotaku.com. Retrieved February 22, 2016. ^ Brett Elston (July 15, 2008). "E3 08: Nintendo Press Conference". gamesradar.com. Retrieved February 24, 2016. ^ a b Ryan Lambie (July 1, 2015). "7 Surprising Facts About Nintendo's Animal Crossing". mentalfloss.com. Archived from the original on February 27, 2016. Retrieved February 24, 2016. ^ a b James Newton (December 14, 2011). "Feature: Celebrating 10 Years of Animal Crossing". nintendolife.com. Retrieved February 24, 2016. ^ Brandon Sheffield (May 8, 2006). "Crossing into the Mainstream: Katsuya Eguchi on Animal Crossing". gamasutra.com. Retrieved February 24, 2016. This page was last edited on 26 January 2019, at 18:13 (UTC).